Today I spent the morning learning about my three little munchkins. It’s hard to believe I have a 4th grader, a 2nd grader and kindergartner. I really look forward to their yearly conferences, sadly it’s only once a year now but nonetheless, I love it. As a teacher myself (in a form of self-induced retirement) I can’t stress the importance of school strong enough to my kiddos. We read, we write, we do math, we talk about real life application, but coming from mom is not the same as coming from your teacher. So today, as the hubs and I sat in and listened to our kiddos’ teachers talk about how extraordinary they are, it was a good moment (well 3 good moments). Those moments you realize that hey, maybe we are doing something right afterall!! One thing my girls have in common is being too passive in class, not sharing their thoughts, ideas and insights with the rest of their class. Quiet kids?!? Are they really my kids? I appreciate their politeness but I want them to learn to be vocal, strong-minded and share what they know and learn. (Isaac does NOT share that trait!!) I also hope that they open up the computer and read some of my blog posts. Read to see that writing CAN and DOES happen in real life. But truth be told I think my kids are way smarter than I ever was at their age. I think they’re a bit more naive (in a good way and probably because we keep them a bit sheltered) but definitely smarter. I don’t know if it’s the times with fast paced technology at your fingertips or just how this generation is growing up. I know they’ll out smart me one of these days but for now, I hope I still have the upper-hand. Back to school next week for a full week then another 2 day week to conclude “No School November”. Speaking of November, Thanksgiving is less than 2 weeks away and right about now, you should definitely be plotting and planning your menu. Sending out that Google Doc if you’re hosting a Friendsgiving. So I give you another savory side dish to share at your table this year. A little bit classic with some twists, because you know I don’t do full on traditional. Mashed potatoes. Mashed potatoes were not something typical at my Thanksgiving table as we had a plethora of Lebanese side dishes. But I learned very quickly from hosting Friendsgivings that the mashed potatoes are a crucial element to the day. I love a good bowl of mashed potatoes just as much as the next person but for Thanksgiving, let’s give them an extra twist. Carrots + parsnips + roasted garlic + Parmesan cheese make these potatoes stand out from the rest. 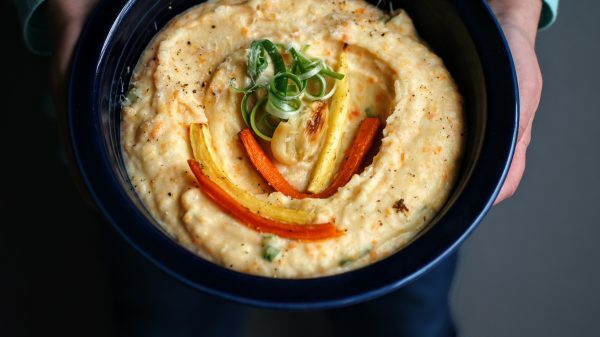 Do you want to know the secret weapon to make the smoothest, perfect mashed potatoes? The food mill! Kind of an ancient looking tool, but it perfectly smooths out the potatoes into fluffy little rice-like granules. You can find them online at Amazon, I prefer the plastic housing versus the metal. This is also what I use to make moujadra if you were curious. These mashed potatoes were at hit at my house, kids couldn’t eat enough. 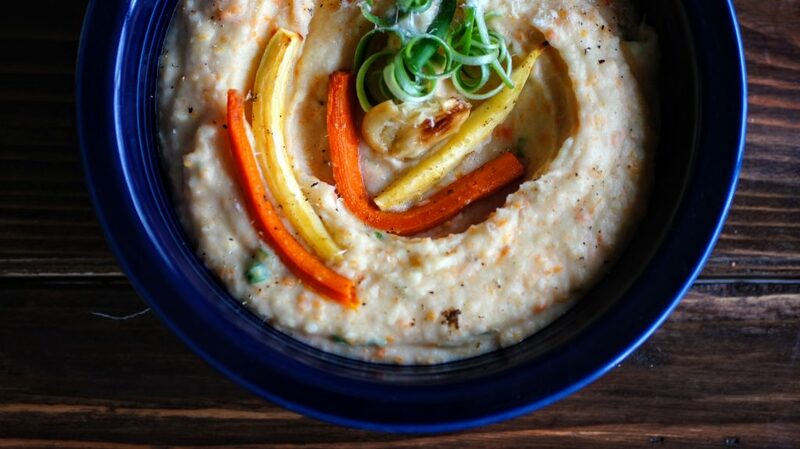 The carrot and parsnips are definitely subtle but add a depth of flavor. So whatever your Thanksgiving day plans are, or if you just need a side of potatoes for dinner tonight. Give these a try, you won’t be disappointed. 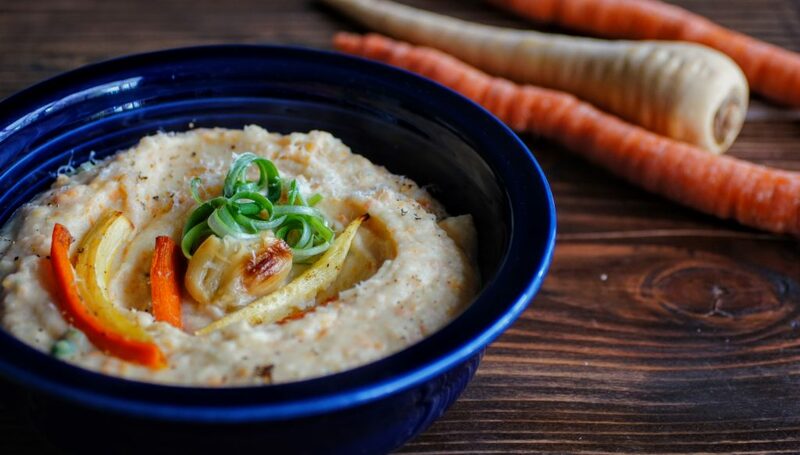 With a quick roasting of carrots + garlic + parsnips and boiling of potatoes, your amazing mashed potatoes are about ready to be transformed into magic. 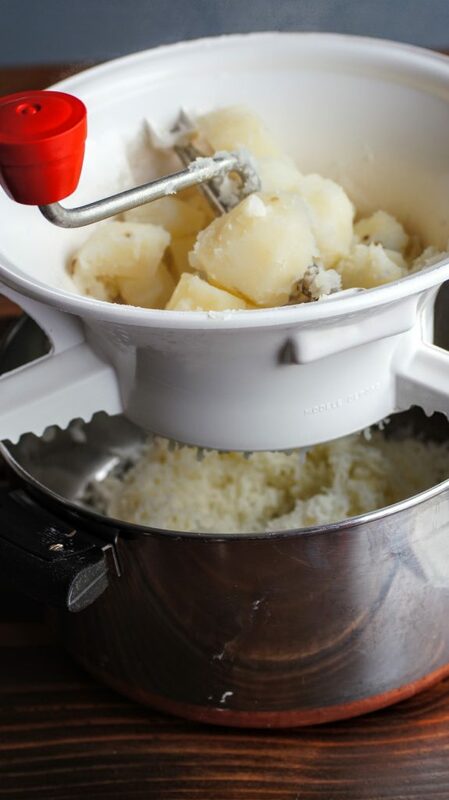 Speaking of the food mill, it’s a magic device, no motor, simple parts and some hand motion to get the creamiest potatoes. After everything is soft and mushy, with a bowl underneath, start churning the mill with your veggies in there a small amount at a time. A few grinds back and forth and the potatoes get mushed through the sieve to perfection! 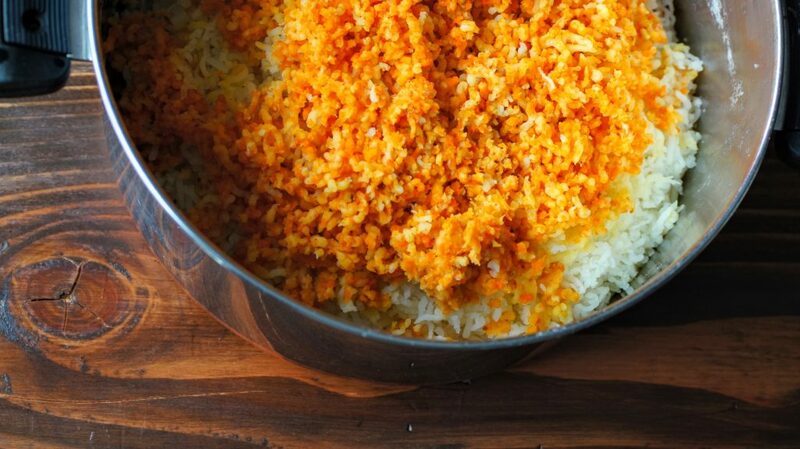 It almost looks like cauliflower rice, once you have your potatoes through, add in your carrots and parsnips. It is essential that these are roasted to a soft texture so they are able to be mushed through the food mill. It will also ensure a smooth consistency of your mashed potatoes. A beautiful array of color, a little jazzier than your standard mashed potatoes for sure!! Add in some butter, milk, scallions, cheese and you have the PERFECT twist on a traditional dish. As always, I love seeing your creations, be sure to tag me on Instagram @CosettesKitchen or post on my Facebook Page. 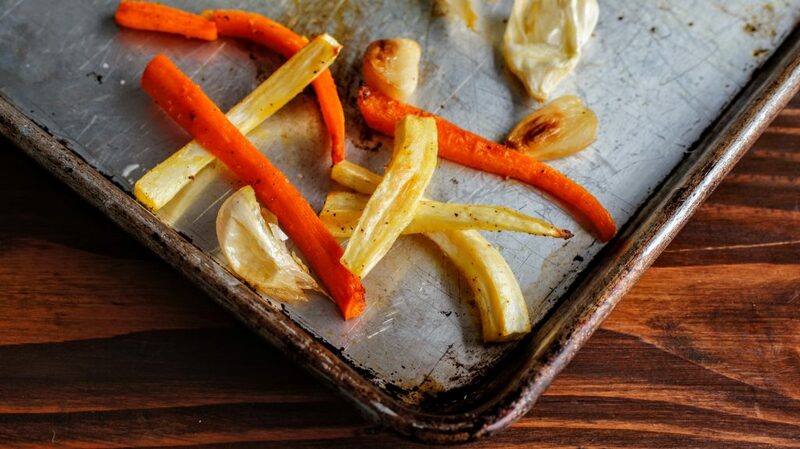 Prepare vegetables by cleaning and peeling carrots, parsnips and potatoes. Slice the carrots and parsnips into strips. Place on sheet pan along with 3 cloves of garlic (peel on). Drizzle with olive oil and salt & pepper. Bake for 15-20 minutes until fork tender. Meanwhile, cut potatoes into small chunks and place in a large pot along with 2 bay leaves and 3 cloves of peeled garlic. Cover with water and boil on stove top until fork tender, about 15-20 minutes. Drain and remove bay leaves. Once all vegetables are fork tender place some of the potatoes in food mill and begin processing. Continue with the remainder of the potatoes, carrots, parsnips and garlic. Place pot back on the stove and add in 1 cup of warm milk and butter and whisk. Add additional milk if needed. Once smooth, add in chopped scallions, Parmesan to your liking and salt and pepper to taste. 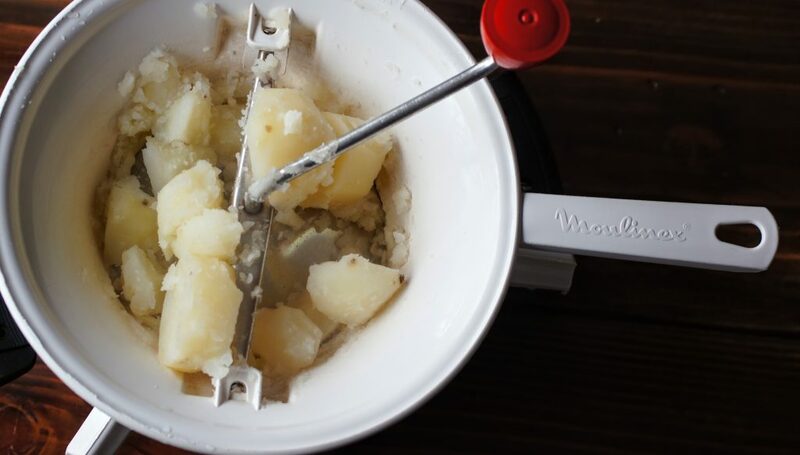 **Keep Warm: The best way to keep mashed potatoes warm is over a double boiler. This way the bottom of potatoes don't burn, they stay warm off the steam. **Prep ahead: Plan ahead and prep your veggies the night before. Place peeled potatoes in water with a splash of vinegar so they don't brown.